Published on June 6, 2010 in General T&T, Media, People's Partnership and Politics. 6 Comments Tags: Jack Warner, Politics, Raffique Shah, T&T Govt. THE People’s Partnership will hardly enjoy a honeymoon period in government. Because its predecessors were so delinquent in addressing real problems affecting citizens, the people are crying out for relief from the ills that affect them. Many voted for the People’s Partnership out of sheer frustration over the way ex-prime minister Manning and his key ministers treated their concerns with contempt. Maybe their expectations are unrealistic. No government can reduce the levels of crime we have experienced over the past decade in a few months. I do not envy National Security Minister, Brigadier John Sandy, as he grapples with robberies and burglaries that have reached epidemic proportions, and murders that continue unabated. Sandy does have a major advantage over Martin Joseph: he has been in the trenches, having served in the Defence Force in varying capacities, from a private soldier to Chief of Defence Staff (CDS). He therefore understands the strengths and weaknesses of Defence Force personnel, and by virtue of his interaction with other arms of the Protective Services, he would understand their challenges too. I note that already he has indicated his intention to legitimise the SAUTT, a grossly-maligned unit that another of his military colleagues, Brigadier Peter Joseph, has built over the past five years or so. My understanding is that SAUTT is confined to gathering intelligence (information on criminals and their activities). In spite of the fact that its members are trained as an elite fighting unit, it does not have the power to act on the information it gathers. In other words, SAUTT is bogged down by bureaucracy. The UNC in opposition was very critical of it, saying it cost a lot but did little. Now they have the power to rectify this anomaly. That should bring greater firepower to bear on those who believe their right to terrorise entire communities comes from the barrel of a gun. There are many other measures that must be implemented if the Government hopes to reduce crime, first to manageable levels, and ultimately to insignificance. An overwhelming majority of the population are law-abiding citizens. Given the necessary assurances, they can play a pivotal role in reducing crime. A people’s partnership must mean more than ministers and senators in government: it must signal a new era in which government partners with the people to address national problems. Meanwhile, Works Minister Jack Warner has tackled head-on some problems plaguing his ministry in a way only Jack does. He rolled up his sleeves, found himself in Caparo where residents faced a crisis caused by irresponsible sand-mining practices. 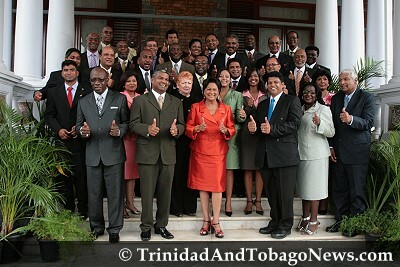 Within 48 hours he got Energy Minister Carolyn Seepersad-Bachan to halt sand-mining in that general area. It’s not that the new government is against quarrying-I should hope not. It’s simply that too many quarry operators have been a law unto themselves, they have ignored environmental concerns, damaged rural roads, made living hell for nearby residents, and they got away with it. This cannot be allowed to continue. The PNM Government talked about it, but never acted. Jack showed up Colm Imbert for what he isn’t, and that in short order-no pun intended. Jack’s other initiative, a declaration to move the main operations of the Licensing Department to Central Trinidad, is most welcome. Decentralisation of ministries and critical state agencies has been touted for 30, 40 years, but without any affirmative action. Since our current network of roads and highways makes no part of the country difficult to access (a PNM boast), shifting operations of agencies like Licensing would make life easier for both employees and the public. I hope the minister acts on this with dispatch. I must, however, warn Mr Warner (sounds good, eh?) that his proposal to open up the Priority Bus Route (PBR) to the public is a disaster-in-the-making. I understand the urgency with which he wants to alleviate the horrendous traffic jams motorists face on a daily basis trying to access Port of Spain. But opening up the PBR to the public, even for limited periods and with pre-conditions, is a recipe for chaos. If anything, the PBR needs to shed some of its current traffic-load. I know what I write about since I use the PTSC bus service to travel from Chaguanas to POS during weekdays. Already there are too many vehicles on that special road. But in off-peak periods, the bus takes around half-hour to make the trip. With additional traffic on the PBR, commute-time will increase by 15 to 30 minutes. Knowing Trinis as we do, every-man-Jack would rush to the PBR to ’try out’ the new system. That will add yet another clogged artery to the city and it would defeat the purpose of the dedicated bus (and maxi-taxis) road. Because the PBR is a narrow, two-lane road that criss-crosses around 30 traffic lights/intersections, accidents will increase exponentially. Also, how many policemen would be required to ensure the proposed usage-rules are enforced? I urge the minister to consult with traffic engineers and planners before executing any such plan. They may well advise that he not only leave the PBR as is, but he start construction of another dedicated bus and public transport road from Chaguanas to Mt Hope. That’s one solution to North-South traffic woes. Implementing it would also signal the timely death of Imbert’s $15 billion bound-to-fail rapid rail. He would say that, wouldn’t he? That’s the likely response of most citizens to former People’s National Movement (PNM) transport minister Colm Imbert’s bucket of cold water dashed on an experimental traffic management plan of his People’s Partnership successor, Jack Warner. The problem is there.We need Officers from behind the desks,to get at the intersections,and look to pull the Traffic,when they disembark,from the Route,in POS.then move the traffic flow in to the city areas,get A man like SNAGG,former PO. Let every one put a hand together,to do this Job.TNT belongs to ALL,not Some.Colm,take a side now.Shut up you are in opposition now.Your Time Expired on the 24th.Rowley Is this all you could address Jack about?This man is a Work Horse,give him room,he would shine. Ah, so glad the election snoozer is over , and our government is finally ready to get down and dirty , to the business of putting our country back on track after decades of mismanagement, hmmm? Let’s see if we understand Uncle Shah well. Build a new road, but scrap the proposed Rapid Rail. I love my privilege of using the PBR, but hate the fact that a few peons may be allowed so to do as well. New National Security Minister, Brigadier John Sandy,would do a way better job than his predecessor Martin, as the former spent the past 36 years in the military trenches, understands Defense Force personnel, and has a certain camaraderie with selective members of other security branches. In support of UNC previous , out of power claims ,SAUTT under another military head honcho, Brigadier Peter Joseph , was an obvious , bureaucratic, waste, but our new Brigadier Minister Sandy has the ability to make it function under a new regime, perhaps at less cost,and it’s time criminals should beware. On a point of order Uncle Shah, can we assume that 1995 to 2002 were highlight periods when Brigadier Joseph Theodore, and successor Hon. Basdeo Panday were in charge of National Security? On a lighter note, care to tell us why the folks in this photo are all displaying that impish ‘kumbaya’ grin , with their thumbs in the air ,as if they are winners of the once mighty CLICO ,Insurance Million Dollar sweepstake bonuses, for selling faulty policies to unsuspecting, gullible , clients? Sorry , that was before Uncle Dookee informed the nation that we were now broke, and might have to follow our Jamaican desperate friends, and run begging to the IMF for loans to pay back the upcoming law suits we would have to pay, to satisfy foreign contractors, when our misguided leaders cancels every past governmental contract started during their reign.What’s that you said ,déjà vu all over? I see ,”Houses before Horses,”eh? Changes ain’t easy, or rather ,nation building ,can be challenging, yes? Agreed, so let’s wish the people of Sweet T&T aka Rainbow Country well,as they would need it. if crime was only done by poor trinidadians then these criminals would have been taken care of long time. a study of severity of what will happen if this bridge were to become damaged or fall or render unusable. To me this is a very critical issue. There are so many big loaded trucks one behind the other that passes over this bridge that it is simply scary. This needs immediate attention. Next, Immigration at Piarco needs some critical reform in the way they process travellers. They take too long with each visitor. If a visitor has an issue simply take that individual in one of the offices and have another officer address the individual. What do is hold up the entire line. This gets very frastrating and it makes the country looks really stupid. Mr Shah, could you raise this issue in an article or to the Ministries concerned. Have a ‘lil bit o empathy,’ with our over work Sweet T&T Immigration crew Mitch Georgia Atlanta, and we’ll do the same for you and your government as it spends billions in trying to build walls around American borders to keep brown , yellow, and Black folks out , or overburden the already depleted ,National Guards with national border patrols , when they could be doing more constructive things, such as helping to stop the BP oil leak, and build levees to save New Orleans from another possible Katrina pending Hurricane flood disaster. As to your other point, don’t worry Mitch Caroni River would be rectified soon enough by Representative Dr Gooppeesing. Thje man might be a racist , but no fool , with the rain and flood season around, he knows that ‘dem’ Maraval ,Diego Martin and Central, bourgeois ain’t seelping well at nights, as long as rubbish are still thrown into the streets, so as to clog of the drains by desperate hard head PNMites voters , in the Lavantille, Mt. Dor, John, John ,Upper Gonzales Belmont ,La Siva , and similar Brazilian Favelas. It’s called prioritization my friend. Of course uncle Jack is Sambaing in South Africa as we speak , but that’s ok , as he possess loyal and competent Permanent Secretaries to carry on dem non existent projects, and analyze futile expensive feasibility studies moving. Just love these phony Trini Yankee Americans. Oh sorry he / she is a Atlanta Georgian , and they hate Yankees , but love their Confederate flag, and Carnival devoid of KKK police monitors.